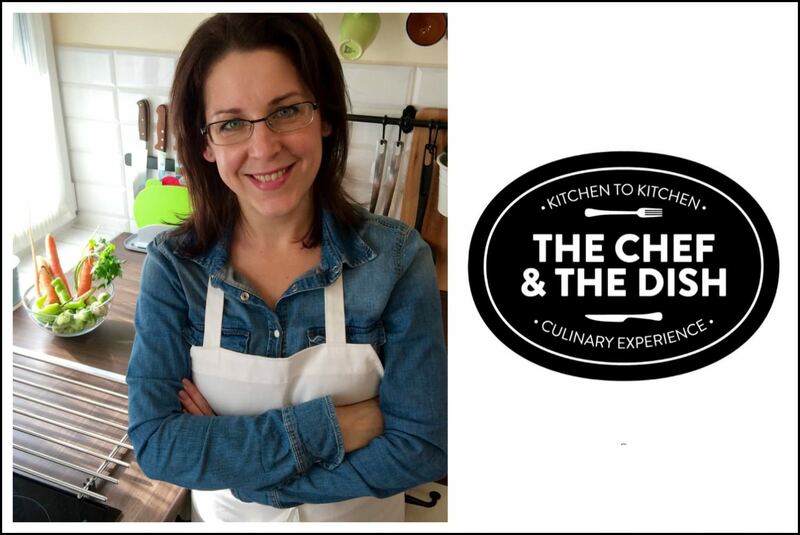 We bring the cooking class to you, wherever you might be staying in Budapest while visiting our beautiful city. 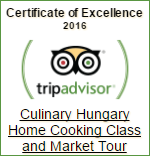 No need for you to go anywhere to take a cooking class in Budapest and enjoy a special day learning to cook authentic Hungarian recipes! We will arrive at your rented Budapest home with everything you will need for your lesson, including the freshest ingredients, spices, some wine, palinka (Hungarian fruit brandy) and extensive knowledge of the Hungarian culinary tradition! Food has always provided a way for travelers to connect with local cultures and a hands-on cooking class in Budapest is a great way to experience Hungary in a unique and delicious way. The cooking program lasts around 3-4 hours while you will learn how to make the traditional Hungarian dishes, you prepare 3 recipes from start to finish. The menu is subject of discussion. We offer dishes and recipes that we believe will be possible to make again once you go back home. Our lessons are very informal, full of conversation and held in English. You will get in touch with the techniques and the traditions of the Hungarian cookery, you will peel and chop and stir and of course drink some great wine! That is an important ingredient, we assure you there is plenty! We are ready for everything! We arrive with all the tools we could possibly need. This can be the highlight of your trip to Hungary. The HUF price is fix. EUR and USD prices are based on an average rate. It is only informational. The actual price may vary depending on the conversion rate of the given day. 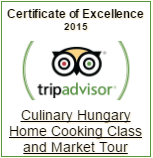 A 4 hour long guided culinary and cultural adventure at your Budapest rental apartment. We need a minimum of 2 people to do the cooking program. Payment: You can pay in cash after the cooking program, we accept Euros, US dollars or Forints. Our cooking program comes with a 100% money back guarantee. If at anytime during the cooking session you decide it is not for you, you are not satisfied with our service, or you just expected something else, please let us know and you do not have to pay or we will be happy to refund your money. No question asked.